Treat yourself and be inspired to create beautiful paintings with natural Wild Colours watercolours. Wild Colours Artist’s watercolours are exciting to use, and make an unusual present for the artist. Most artists love trying out something different! Buy limited edition watercolours made from European plant dyes. We stock 2 colours of blue from woad (dark and medium). These colours are all available in 10 ml tubes and are easy to use straight from the tube. These pigment based colours can be mixed with great results. Shipped worldwide. Read more about our watercolor paints from natural plant dyes here. Did you know that woad was used to paint the blues in the Lindesfarne Gospels? Buy artists watercolour paints made with pure woad pigment and gum arabic, a natural binding agent. Our woad paint is specifically designed for watercolor painting, produces a large range of different blue-grey shades, from dark blue-blacks to pale light blues, and is easy to apply by adding water. Easy to use straight from the tube. 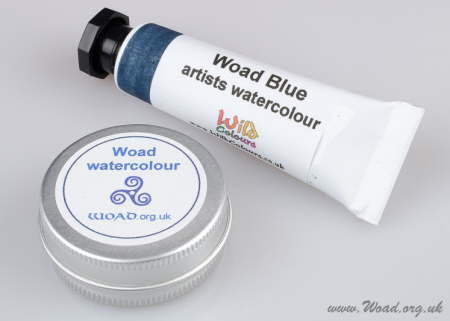 This woad watercolor paint gives a wide range of useful and exciting watercolours. Subtle differences in colour may occur depending on the climate and soil from where the dye plants are harvested. All our watercolour paints are shipped worldwide.